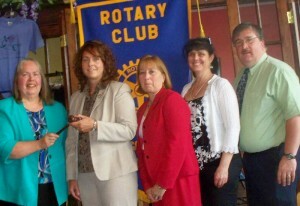 OSWEGO, NY – On Thursday, the Oswego Sunrise Rotary Club members installed its officers for 2011 -2012. Past president Carol Reed, president Michelle McGrath, president-elect Cindy Tascarello, vice president Lisa Shaw and secretary Donald Todd. Michelle McGrath will serve as club president. Cindy Tascarello will serve as president-elect. Lisa Shaw will be vice president. Donald Todd will continue as secretary. Bill Symons was elected as treasurer but was not present at the installation.